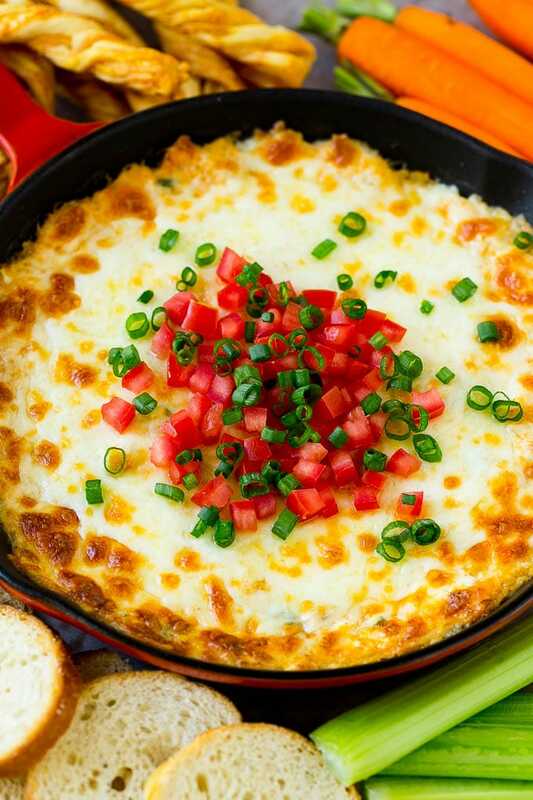 This hot crab dip is a mixture of crab, cheese and spices, all baked together to form a creamy dip that’s bound to get rave reviews. A super easy make-ahead appetizer that is always a crowd pleaser! I love to serve dips at parties, they’re easy, most can be made in advance, and people go crazy over them. 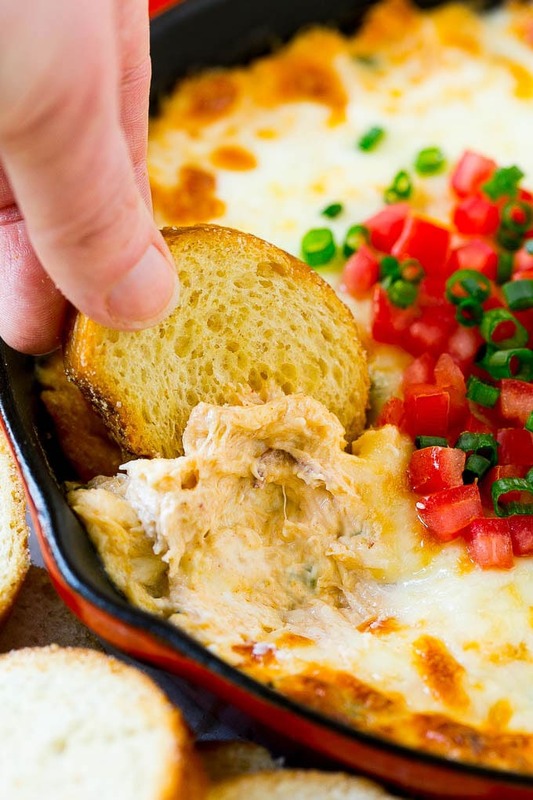 Some of our favorites include BLT dip, jalapeno popper dip, and this decadent crab dip. I serve at least one dip at every party; they’re easy to make, feed a lot of people, and there are so many different flavor possibilities! The star of this crab dip is a hefty dose of real crab, which is served up in a creamy base with plenty of cheese. How do you make crab dip? 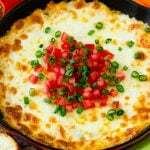 This dip is made with real crab meat, mayonnaise, cream cheese, Monterey Jack cheese, green onions and spices. Everything gets combined, then goes into a skillet to bake to gooey brown perfection. Add a sprinkling of fresh tomatoes and green onions and you’ll be ready to eat! Splurge a little and use real crab here. I used frozen crab meat, but you can also buy refrigerated crab meat in cans in the refrigerated area of the seafood counter. In a pinch you can use imitation crab, but it won’t have the same flavor. I use Monterey Jack cheese because it’s a mild, creamy cheese that melts well and doesn’t overpower the flavor of the crab. Other cheese options include mozzarella, cheddar or fontina. Green onions are a fairly standard addition to crab dip – if you don’t have them on hand, you can try parsley instead. My recipe calls for smoked paprika – it’s definitely worth purchasing this spice if you don’t already have it in the pantry. 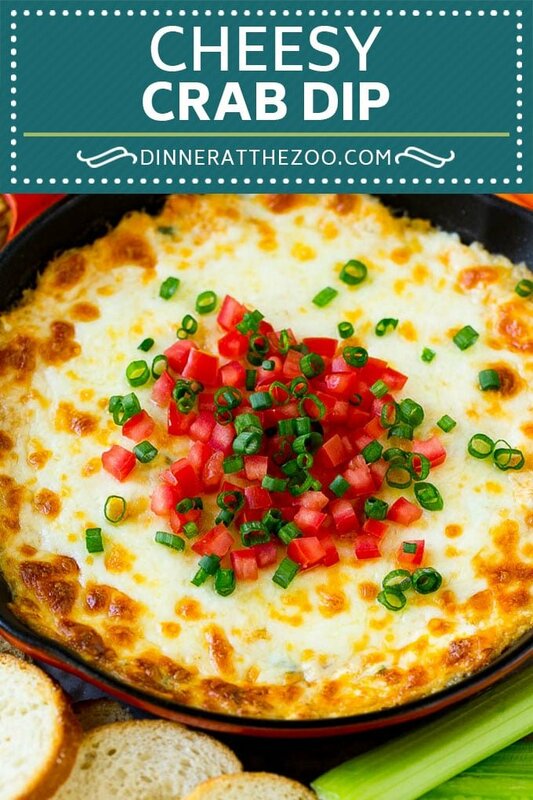 This dip can be made in an oven safe skillet or in a baking dish, whichever you prefer. Serve your crab dip with baguette chips (crostini), vegetables, breadsticks and crackers. You can assemble your crab dip up to 8 hours before you plan to serve it. Simply cover the dip and refrigerate it, then place the crab dip in the oven right before you’re ready to eat. You may need to add a few extra minutes to the bake time since you’re starting with a cold dip. Crab meat doesn’t need a whole lot added to it to make it special, but here are a few ways to jazz up your basic crab dip if you’re looking for a new flavor combination. Spicy: Add minced pickled jalapenos. Artichokes: Add 1/2 cup chopped marinated artichoke hearts. Seafood: Use 4 ounces of crab meat and 4 ounces of salad sized shrimp. Bacon: Add 1/2 cup of cooked crumbled bacon on top of the baked dip. 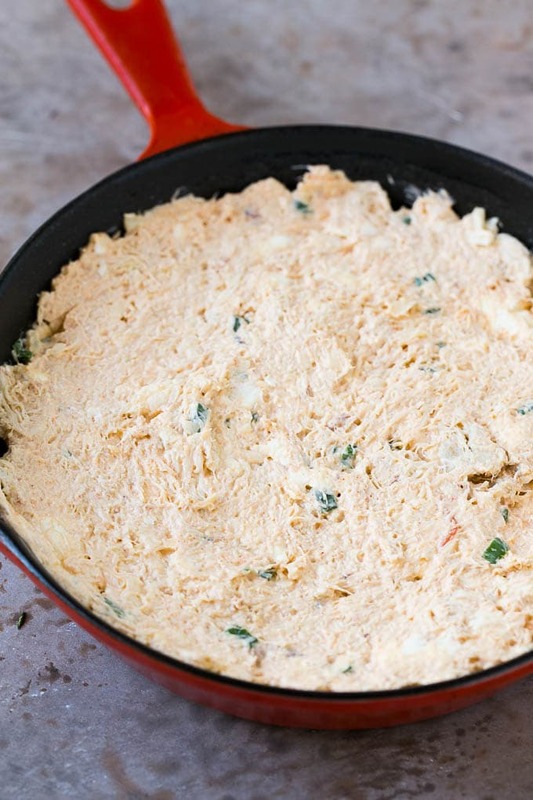 No matter how you decide to serve your crab dip, it’s sure to be a hit. Crab can be expensive when it’s not in season, so I save this dip for a special occasion and my guests are always so happy and impressed! This hot crab dip is a mixture of crab, cheese and spices, all baked together to form a creamy dip that's bound to get rave reviews. A super easy make-ahead appetizer that is always a crowd pleaser! Preheat the oven to 375 degrees F. Coat a small baking dish or oven proof skillet with cooking spray. 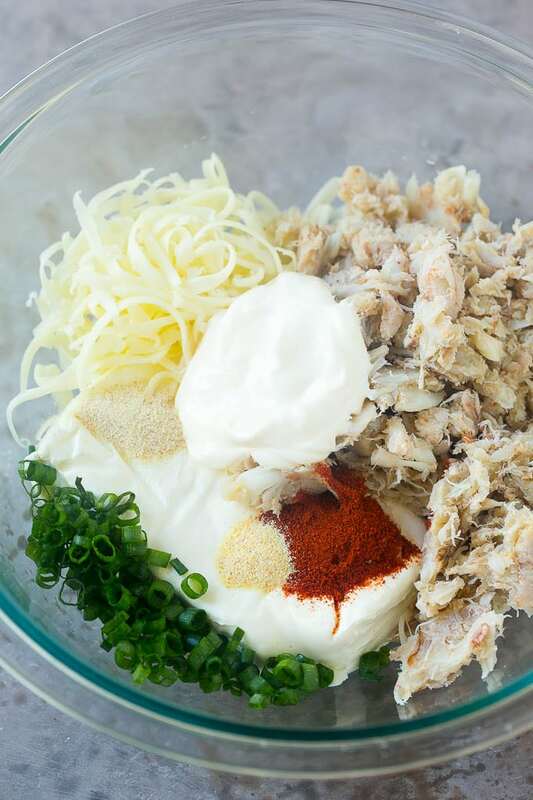 Place the crab, cream cheese, mayonnaise, garlic powder, onion powder, smoked paprika, 1/4 cup green onions and 1/2 cup Monterey Jack cheese in a bowl. Stir to combine. Spread the crab mixture evenly into the prepared dish. Top with the remaining cup of cheese. 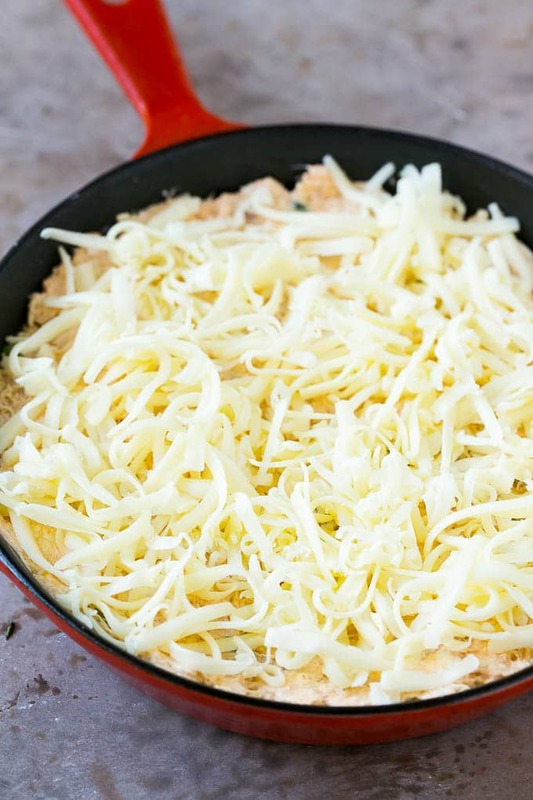 Bake for 20 minutes or until dip is bubbly and cheese is melted. Broil for 1-2 minutes until cheese has started to brown. Top with remaining 1/4 cup green onions and tomatoes, then serve immediately. This sounds like the perfect recipe! I have to try it out one night for the family. I don’t eat a lot of crab but I don’t know why as I really enjoy it!! Thanks for the recipe inspiration.